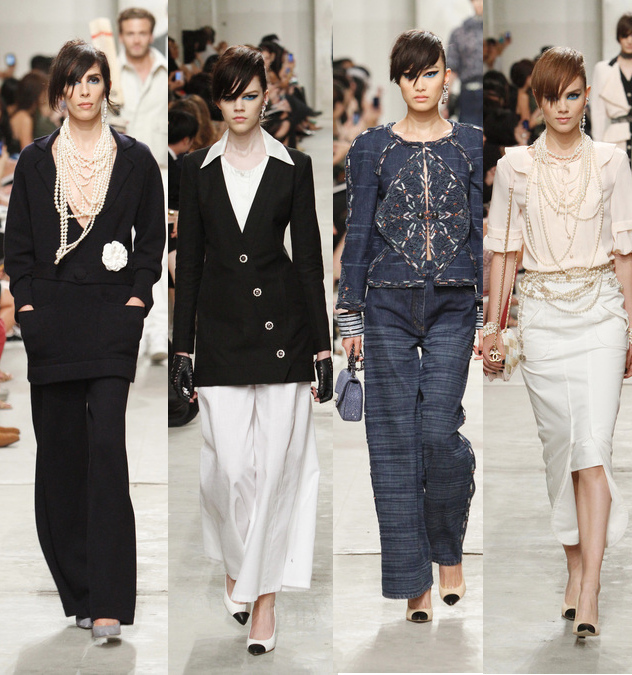 Chanel's Cruise 2014 collection had a little bit for everyone - punk and pearls. Karl Lagerfeld presented this week Chanel's cruise 2014 collection in Singapore; what a trip. This is what most cruise shows are all about - creating a laid-back, and comfortable collection most clients can connect to for their summer vacation looks. When it comes to Chanel's show, such as this one, clothes may appear relaxed, but details are what execute a perfect cruise collection fit for a luxury customer. It is no doubt that Chanel is the best of the best in turning something simple into the most detailed and luxurious garment you've ever seen. Chanel's Cruise 2014 wide-leg trousers were one of the best made trousers. There were quite a variety of punk elements mixed into this collection - faux hawks, chokers, eyeliners, latex, leather gloves - that brought me a curiosity as if Mr. Lagerfeld still had some inspiration left from the recent Met Gala's Punk: Chaos to Couture exhibition. And while punk seemed to be the "it" accessories, pearls came in the way as well - almost bathed in them. Who would've though pearls and punk faux hawks would look so good? Chanel demonstrated just how hot pearls can get along with any personality so well it could become the next must have accessory for any woman. Besides the semi punk theme look, Lagerfeld emphasized other aspects of its founder Coco Chanel some wouldn't think of. Modern interpretations of Chanel's wide-leg trousers - crisp white, cream, and denim - brought the rebellious side of Coco from the 20s paired with oversize t-shirts - created luxuriously well compared to your so thought gangster shirt. Tweed jackets were not surprisingly another main iconic piece, which were upgraded. All these elements made the plot of the sailor story more enjoyable. Lace and knitwear were very pleasing at Chanel's Cruise 2014 collection. What was surprising here, were Karl's lace numbers - fresh, young, and full of life. I never think of Chanel as a lace type of brand, but these were one good selection of treasures that are sure to sell out. It's crochet pieces were another to take a closer look at. One to have died for was the short knitted dress - in leather? colors - that could look good for your beachwear adventure. I hope this is the place to take it. Overall, it is only Karl Lagerfeld who can make an 80 piece collection seem non-boring. In fact, you'd wish there were more pieces available together with the whole collection ready to be bought fresh out of the runway. He always manages to keep the flow of the brand with just a little twist here and there without hesitation. And we (I) love him for that.